In 1987 Mr. Janssens, with the help of his friends, set up the Institut Van Gogh, and also created the S.A. Ravoux– two organizations, each with its own specific purpose. The challenge was to marry “economics and culture” and “passion and reason” while maintaining the independence of each half of the equation. Economic credibility was guaranteed by the Ravoux S.A., and cultural legitimacy by the Institut Van Gogh. But Vincent van Gogh’s modest dream is now far more than a modest challenge, given the huge prices his paintings fetch on the art market today. 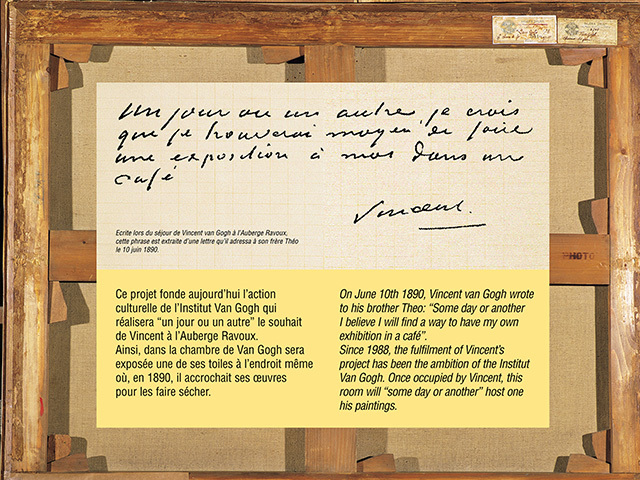 Nevertheless the Institut Van Gogh believes that if it is supported by the lovers of Van Gogh’s art worldwide, it will be possible to climb the last few steps to the top floor and make Van Gogh’s dream a reality.